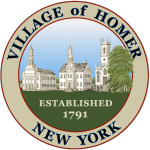 To apply for a job with the Village of Homer, complete an Application for Job/Civil Service Exam. If you answered “yes” to question 5e or 5g on the employment application you must also fill out a Disclosure and Consent Form for Background Investigation. Completed applications must be sent to Cortland County Personnel. They cannot accept electronic signatures at this time so you must print and sign, and then submit by mail or fax.